Founded by Leo F. Doyle in 2001, Midwest Internet is a premier provider of networking and Internet Services. Doyle, a former Purdue professor, founded the first commercial ISP (Internet Service Provider) in Indiana--IndyNet. In 1994, Prof. Doyle left Purdue to devote himself full time to IndyNet. In 1998, Mr. Doyle sold IndyNet to OneMain.com (as part of a successful “dot com” IPO [Initial Public Offering]). IndyNet was one of the state's largest ISPs with over 20,000 subscribers. Mr. Doyle served as Vice President of OneMain.com before focusing his attention on several local business interests. IndyNet and OneMain.com are now owned by Earthlink (the nation's third largest ISP). When Earthlink consolidated IndyNet into its business and started to lay off IndyNet's former employees, Leo Doyle started hiring them. After being part of a successful “dot com” IPO, Mr. Doyle found himself in a position to fund numerous new businesses. In addition to financial resources, he had the personnel to start a new high tech venture. He eventually started Midwest Internet. With the old IndyNet crew, Midwest Internet has the knowledge and experience to handle any networking or Internet challenge. The company, which is very well funded, has no debt and owns all of its equipment and facilities in Indianapolis and Anderson, Indiana. Midwest Internet's Network Operations Center (NOC), just off of Keystone and 54th. St., in Indianapolis, is one of the best-connected buildings in Indiana. The building, which has been used for providing Internet services for over ten years, is wholly owned and operated by one of Mr. Doyle's other companies, LFD Properties, Inc. The center has fiber-optic connections to all of the major telecommunication carriers in Central Indiana, including Time Warner Telecom, Level 3, AT&T and others. For Midwest Internet's web hosting and co-location customers it has redundant DS-3 and 100 Meg Ethernet connections to the Internet, backup power, and secure, monitored facilities. Having started in 2001, Midwest Internet's equipment is new and state-of-the-art. Unlike most of Midwest Internet's competitors, Midwest does not have to support legacy equipment that was purchased years ago. Instead, Midwest has been able to design its network from the ground up using only the latest technology. For dial-up servers and routers, Midwest uses Cisco equipment exclusively. Midwest has redundant connections to the Internet setup on separate redundant border routers going to separate upstream providers through multiple fiber-optic connections. All of Midwest Internet's servers are made by Sun Microsystems and run Solaris operating systems. The facilities have been designed to include the best fault tolerance possible including multiple battery back-ups and multiple generators to protect against power disruptions. Midwest Internet offers exceptional customer service. Dedicated hosting and T-1 customer's are monitored 24 hours a day 7 days a week. If there is a problem, Midwest 's service staff will be on it immediately. Since Midwest Internet is a local company, you can meet the people that will be servicing your account. Midwest Internet's doors are always open for customers and prospective customers to tour our facility. Midwest Internet's expert personnel are popular on the local lecture circuit giving talks on a variety of topics including the History of Internet in Indiana, Internet Security, UNIX Administration, and other networking related topics. 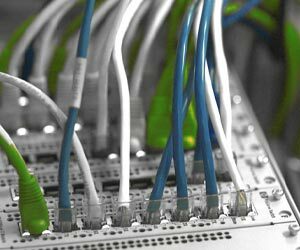 Midwest Internet's employees possess expertise in all aspects of WAN, MAN and LAN specifications and engineering. Some of the areas of expertise include, UNIX, Linux, Apache, Radius, Cisco Routers and access servers, PHP, Perl, SQL, 802.11 wireless networking, Sun Solaris, Send Mail, and Windows. Multiple routes to the Internet over multiple fiber optic connections (both above and below ground) through multiple vendors (full SONET based). Card Key Entry into building and all secure areas. Closed circuit video surveillance and motion sensors. More than 75 years (combined) experience providing network and Internet services. Redundant Power including multiple Uninterruptible Power Supplies and Generators. © 2001,2002,2003,2004,2005,2006 Midwest Internet, Inc. ALL RIGHTS RESERVED. and those trademarks and service marks are the property of their respective owners.